The James Renwick Alliance is hosting a presentation of how Safeway supermarkets support American Craft with their new public art project in Bethsda, MD. The process and inspirations of the artwork will be reviewed in the talk. Find out about tickets by clicking on the link! The JRA is an independent national nonprofit organization dedicated to advancing scholarship and education on contemporary American craft, to supporting activities directed toward this purpose, and to encouraging connoisseurship and collecting. The Alliance assists the Smithsonian American Art Museum’s Renwick Gallery in adding to its permanent collection of American craft of artistic significance and superior workmanship, supports scholarly research in contemporary American craft, sponsors public educational activities, and pursues other activities in support of the studio craft movement. Ticket cost is a tax deductible nonrefundable contribution of $15 per person and space is limited. 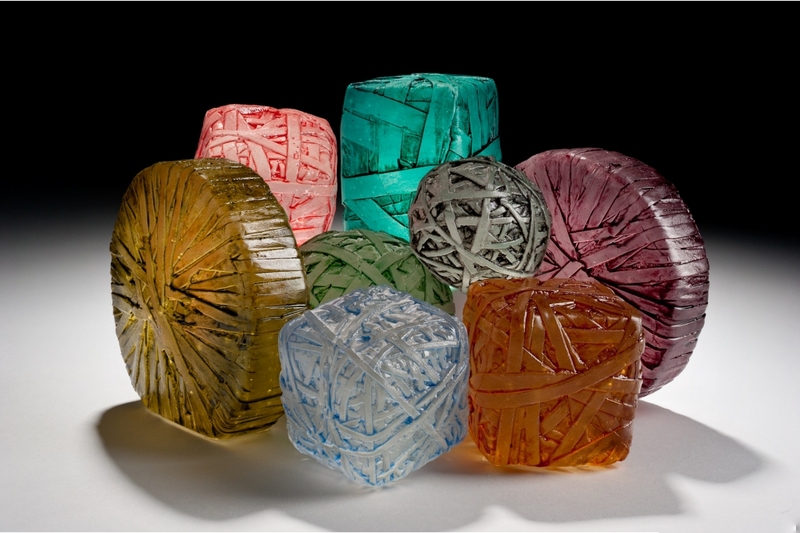 Please RSVP to the JRA office by phone or email (301.907.3888 or admin@jra.org) by 5 p.m. on Monday, December 5 by 5 p.m.
Tim Tate’s cast glass elements. Happy Thanksgiving From All Us Turkeys Here At Washington Glass School! The Washington Glass School presents its 10th annual Winter Sculpture Show and Holiday Open House, featuring works by artists and instructors of the Washington Glass School. This event is more than an art open house – its an experience! Next-door’s Flux Studios and Ellyn Weiss Studio will also be open on the day. Check out what’s happening in THE Creative Arts Center of the DC area! Lowe House Office Building, Prince George’s Delegation Area, Annapolis, MD. The Prince George’s Department of Parks and Recreation, Arts and Cultural Heritage Division, in partnership with the Prince George’s Arts and Humanities Council, is pleased to announces Memories from All Directions, this year’s exhibition of Prince George’s County artists in the Lowe House Office building in Annapolis, during the Maryland General Assembly/ the Legislative Session. Memories define much about who we are. Memories can also define places, culture, and how we see ourselves as a community. Our individual memories influence how we interact in our shared space, and our shared memories influence the directions we take to shape our towns, our county, and our state. Memories from All Directions gives us an opportunity to reflect upon all of these things by asking artist to present artwork related to memories, as they define it. As we and our legislative leaders come together to make important decisions to shape our future, this exhibition celebrates Prince George’s County art and artists as well as art’s unique ability to express the experiences that bring us all together. 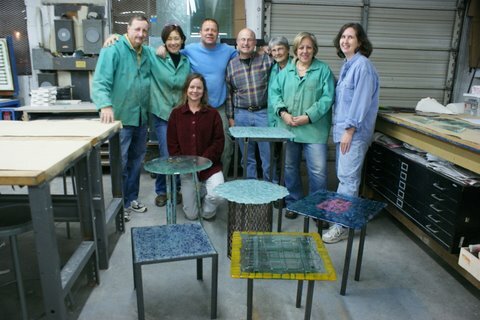 The Eco-Tables class- where the students create the tables using recycled materials (both reclaimed steel & glass) just completed – here are some photos from the class! The class first creating the table-tops, working with salvaged and recycled float glass. 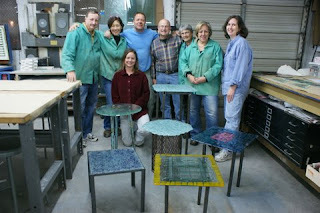 After fusing the recycled glass, the tops were coldworked and made smooth. 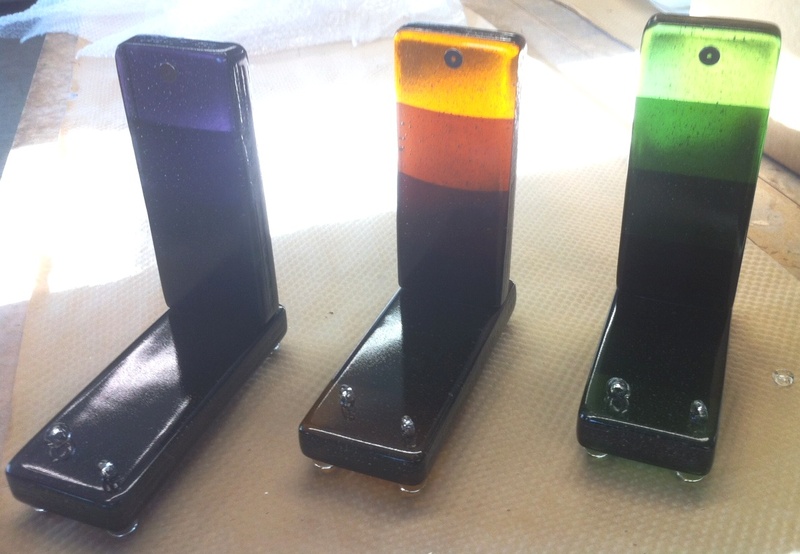 Erwin Timmers – DC’s leading “Green-artist” outlines what is required to make the metal work support. Some students are overwhelmed. Erwin outlines step-by-step the procedures to cut, weld and grind smooth the steelwork. 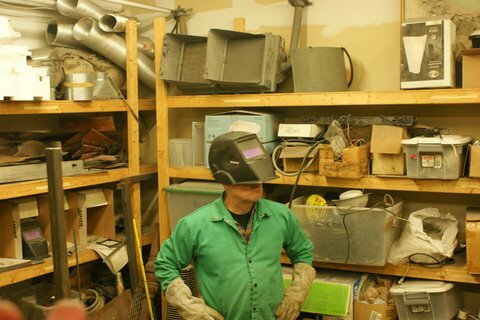 Some of the students were stylin’ in the welding helmets and green welding jackets. 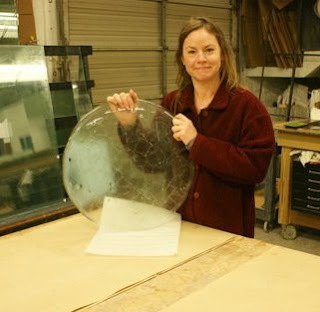 Teaching Assistant Laurie Brown supervises the metal working. Soon, tables are marching out from the coldshop. 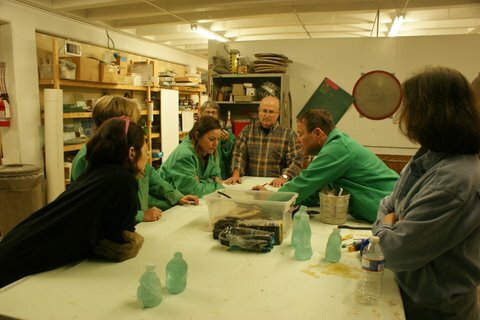 The students – some who have never cut glass or welded before – are amazed at their artwork and celebrate their progress. “What’s next?” is on each student’s mind. The new class schedule is due out soon – Keep posted for the listing! Based on the idea that all big things are ultimately composed of smaller things, Adam Lister Gallery presents a special collection of artwork that represents glimpses from the path that each artist is creating. These small works take on an intimate nature, drawing the viewer in close and giving them a more personal experience. They are components and elements of the bigger picture while functioning as clues and hints into the mind of the artist. 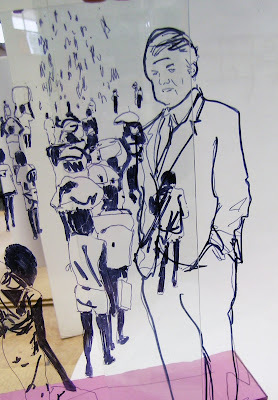 There’s a challenge that the artist faces when dealing with small scale work, it forces them to use a specific control while containing limitless concepts within a limited space. Our little Robert Kincheloe is featured in group show. The U.S. Committee for Refugees and Immigrants (USCRI) celebrated their 100th anniversary at the Andrew Mellon Auditorium. Their mission is to protect the rights and address the needs of persons in forced or voluntary migration worldwide by advancing fair and humane public policy, facilitating and providing direct professional services, and promoting the full participation of migrants in community life. 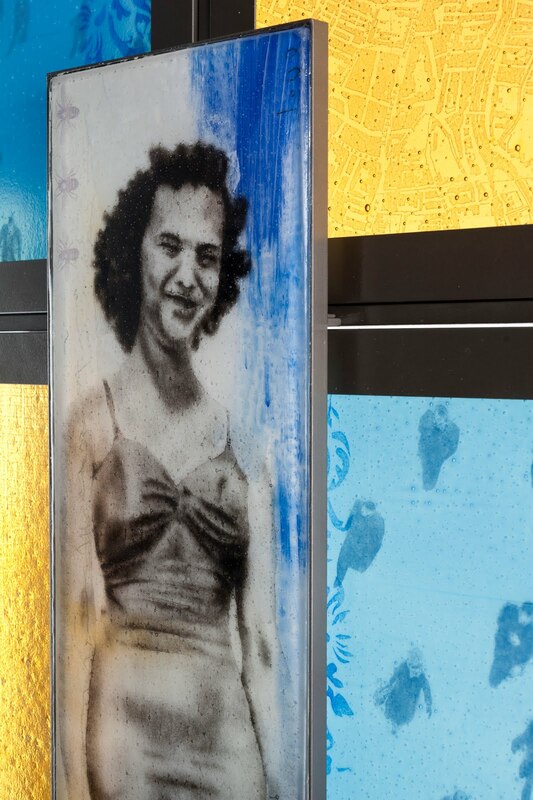 In light of its milestone 100th birthday, USCRI commissioned Michael Janis of the Washington Glass Studio to create commemorative artwork for the family of President Dwight Eisenhower and the family of Senator Edward Kennedy. The USCRI event committee worked with the studio, asking that the artwork represent the respective parts of the world helped by the respective honorees. The design was envisioned to have the central figure “wrapped” by glass powder images of refugees. 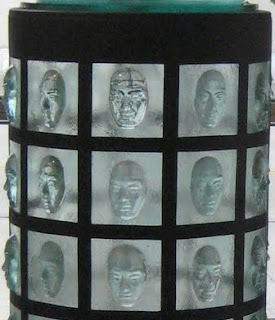 The glass images would be created using glass powder on flat glass, that would be kiln-formed into sculptural shapes. 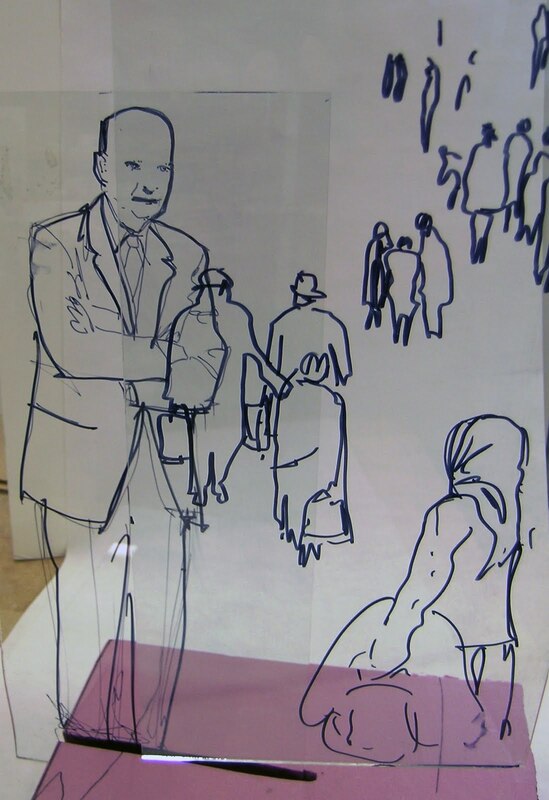 Concept sketch showing President Eisenhower with refugees. Concept outline of Senator Kennedy with refugees. 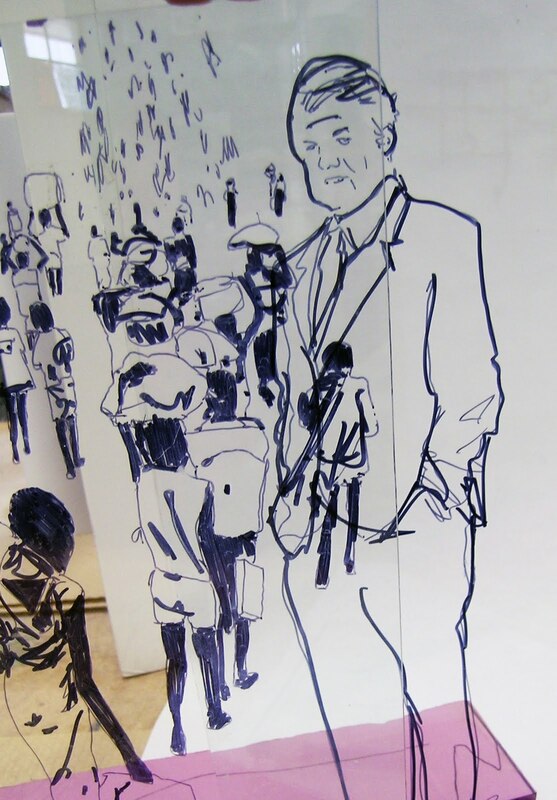 Michael Janis created imagery using his ‘sgraffito’ technique. President Eisenhower and Senator Kennedy were celebrated for their work assisting refugees and immigrants in artwork made by Michael Janis of Washington Glass Studio. 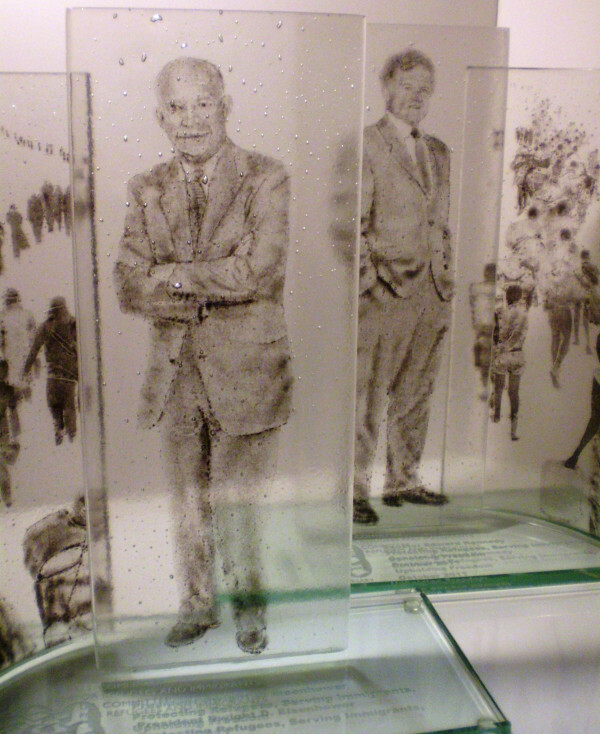 To highlight the award presentation, video images of the glass artwork were broadcast on the stage during the dinner. Filmed by Lucky Dog Productions, the glass artwork was shown rotating to capture all sides of the works. above video is the raw footage shot by Lucky Dog Productions – a bit spinny for some – it gives an idea of the artwork in 360 degrees. The final video was slowed down for the broadcast presentation. 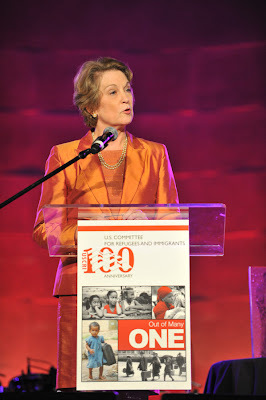 Hosted by Cynee Simpson and Chris Spencer, the centennial gala was held at the Andrew Mellon Auditorium October 19, 2011. The black-tie event included celebrity guests and auctions to raise money for the charity organization. Susan Eisenhower accepted USCRI’s Centennial Award for her grandfather, President Dwight D. Eisenhower. Ken Leung – from our favorite TV show LOST, was a guest at the gala. Ken was a co-star on LOST, along with the USCRI Global Ambassador, Jeff Fahey. Susan Eisenhower & Cynne Simpson posing with the Centennial Awards for President Eisenhower & Senator Kennedy. Wyclef Jean provided entertainment for the night at the Mellon Auditorium. 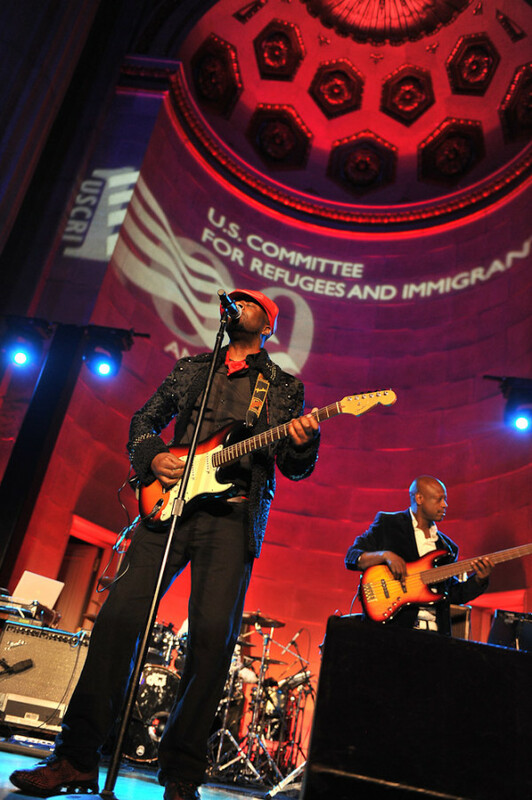 Wyclef Jean attended to support and encourage the work done by the USCRI. Mr. Jean autographed memorabilia, then energized the crowd with his singing and dancing. However, the highlight of the evening was his display of an unusual talent. Wyclef Jean played his guitar with his tongue, and didn’t miss a beat. Soon, everyone joined in the fun – including Ken Leung showing his break-dancing finesse. Ken Leung (aka LOST’s Miles Straume) busting a move… that or he is doing his version of the spinning awards. WGS joins all in congratulating and celebrating the USCRI’s 100 years. Finally had a chance to catch my breath from a rushed viewing of the 18th Annual Sculpture Objects and Functional Art Fair (SOFA) held at Chicago’s Navy Pier!. This year’s SOFA Chicago featured more than 60 international art galleries and dealers presenting museum-quality artworks and design, as well as lecture and tour series. The Washington, DC gallery showcased the newest works by WGS artists Michael Janis and Allegra Marquart alongside some of the “glass superstar legends” like Harvey Littleton, Therman Statom and Ginny Ruffner. Works shown include Colin Reed, John Littleton, Kate Vogel, Harvey Littleton, Michael Janis, Therman Staom, Allegra Marquart, Ginny Ruffner and Drew Storm Graham. Allegra Marquart’s new narrative sandcarved glass panels (L) and Drew Storm Graham’s wood assemblages (R). 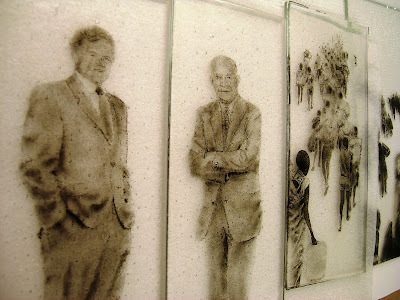 John Littleton and Kate Vogel’s cast glass artwork. The Santa Fe gallery had a strong mix of artists in a variety of media. 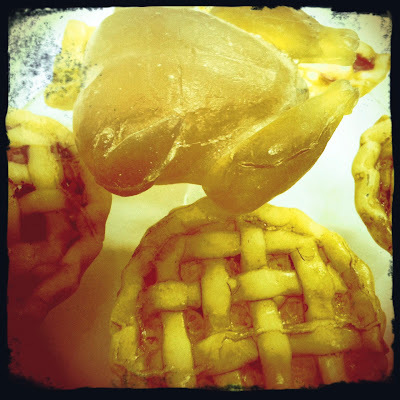 Tim Tate’s delicious new works – cast glass sweets! Tim also featured framed hand-colored prints of his imagery. 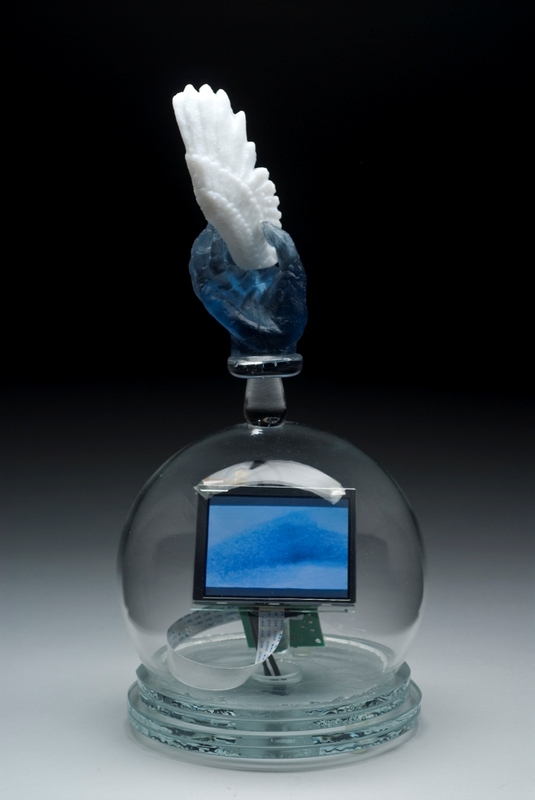 Tim Tate’s video reliquaries are always a show favorite. 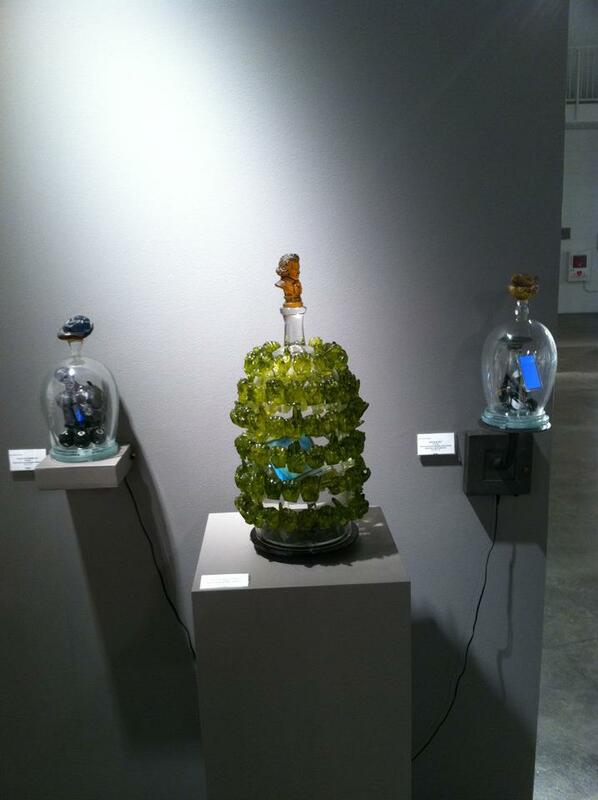 The Cincinnati gallery had a stunning solo show of cast glass work by Bertil Vallien. A stunning cross-section of Bertil’s works. Bertil’s ladle cast glass encases beautiful imagery. The Portland, OR based gallery featured the new directions kilnformed glass is heading. 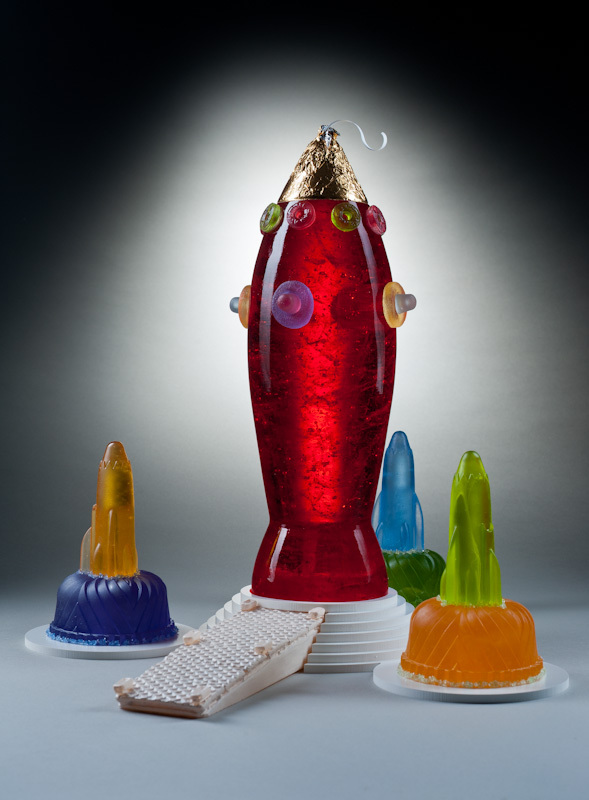 Silvia Levensen’s fun sculpture and fused glass panels. Catherine Newell’s new fused glass panels. Always a must-see, the New York gallery had some instant favorites. Susan Taylor Glasgow’s “Communal Nest” -a large-scale assemblage consisting of glass twigs, real branches, a chair and a glass pillow. The work was built with help from the community and from artists around the world, all of whom contributed glass twigs to this “collective” nest. But despite these and other it-takes-a-village aspects — Susan’s work ultimately suggests a rather ironic view of home. Susan Taylor Glasgow’s visions of domestic bliss. Steffan Dam’s glass recalls scientific analysis. Marc Petrovic’s roll-up process and stunning technique and aesthetic continues to amaze and impress. Beth Lipman’s table of fish. 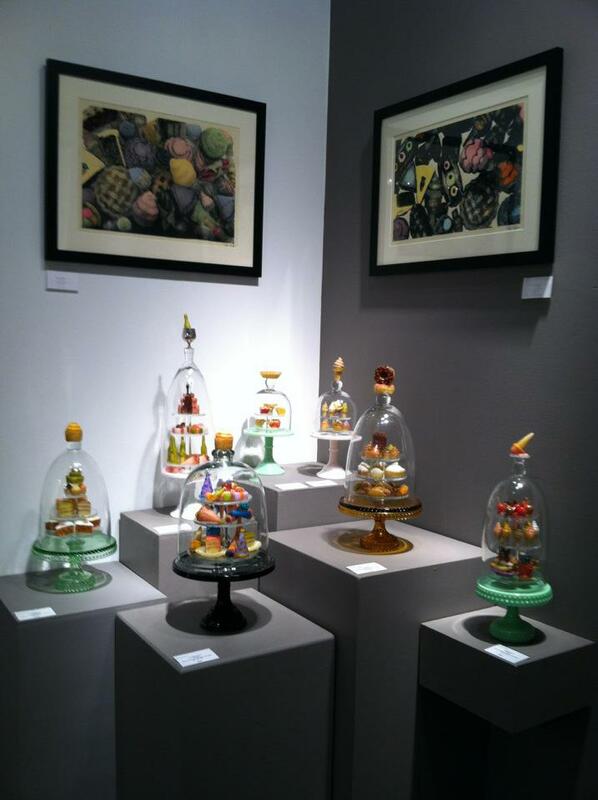 The St Louis gallery featured some glass beauties. Kari Russell Pool’s beautiful flameworked sculptures. Cassandra Blackmore’s abstract glass panels. Janis Miltenberger’s flamework sculpture at Thomas Riley Galleries. Australia’s Beaver Gallery showed Jeremy Lepisto’s crate series. Wexler Gallery showed how the simplicity of Sydney Cash’s work plays with the light. Blue Rain showed the fun and beautiful work by Rik Allen. Here a glass spaceman floats amongst the glass. The annual show was a great time to see the best of media-based artwork and meet some of the artists I’ve only read about. Many thanks to Betty Py for the photos – for more of her images of glass art shown at SOFA – CLICK HERE to jump to the Flickr site she set up for Washington Glass School.